Mexican Day of the Dead is a tradition that has been celebrated for centuries with colour, candy skulls and so many other crafty decorations. Today we are going to show you how to bring this spooky and fascinating look into your home this Halloween with our free template and other creative ideas. To give your sweets the haunted look they deserve, we are going to take you step by step to create a Mexican Day of the Dead themed coffin box to hold your party treats! 1. 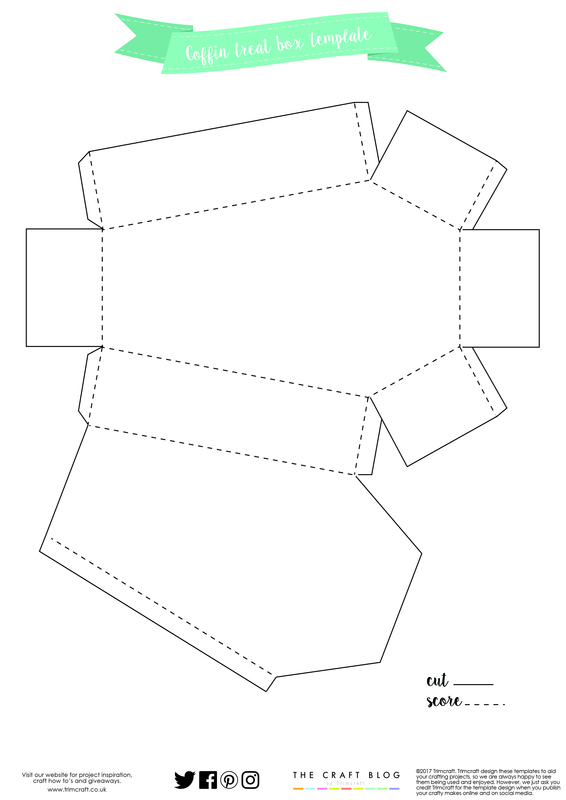 Begin by downloading, printing and cutting out the free coffin box template. 2. Next, adhere your template with Washi Tape on to your chosen Dovecraft A4 Coloured Card sheet. Cut away the excess. 3. Score your template as indicated on the printable. Take the template off the card and fold your coffin box into shape. 4. Draw around the inside of the coffin on to your chosen Dovecraft A4 Glitter card. Cut out. 5. Adhere the glitter card to the inside of your coffin box with Dovecraft Perma Fix. 6. Add Dovecraft Perma Fix tape to the tabs and create the coffin box shape, ensure the box is secure. 7. Next, cut a small rectangular piece of black Dovecraft, fold the two ends of the card inward, to make a shelf. Die cut a border die from the First Edition Decorative border dies, cut it down to fit along one edge, ensuring to not cover the folded parts of the card. 8. Slide it in to your coffin to ensure it’s the right size and once you’re happy with how it looks, adhere the two folded sides to the coffin with Dovecraft Perma Fix Tape. 9. Next, die cut a selection of Mexican of the Day themed dies onto Dovecraft glitter card. We have used the Fiesta, flower and beach dies. We also have used the Dovecraft Flower dies as these will fit nicely on the coffin. 10. Cat has used 3D foam pads to decorate her coffin with the die cuts, to add dimension to her design. 11. She has also decorated the front of the coffin to complete the design. How cool is this coffin box design? The perfect way of presenting your treats at your Mexican Day of the Day themed party! You can use different card and die cuts to give each coffin box a cool and inviting look. Parties are the PERFECT opportunity for getting funny snaps with your friends so why not give your photos a day of the dead makeover with our free prop template? 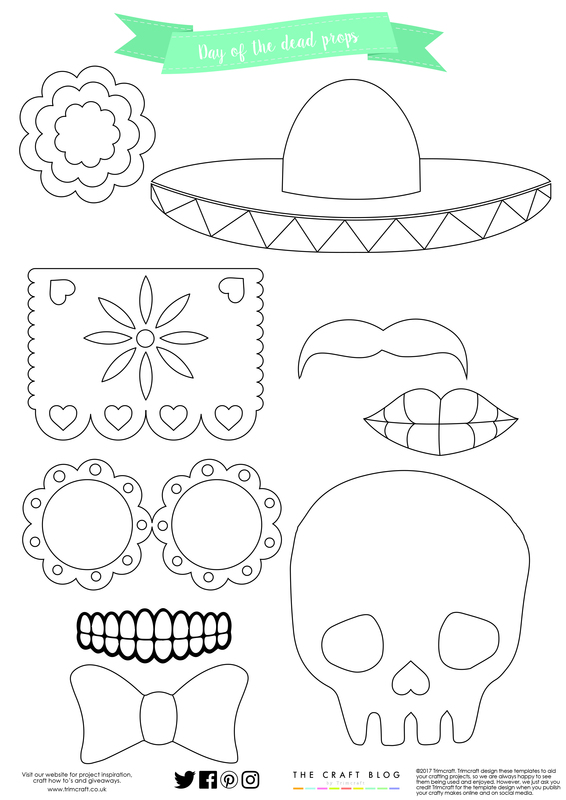 From a skull to a mariachi hat, this printable will give your friends hours of fun. You could use the Dovecraft Candy Skull die to create bunting! Simply die cut it onto different coloured sheets of Dovecraft card and thread onto your twine. Brilliant for spreading a deathly yet colourful look around the house. You often see Day of the Dead celebrations featuring an abundance of candles so to bring this glow in to your home, you could upcycle a jar with the Dovecraft glass paint, candy skull die cuts and gems to act as a colourful holder for your tea light! We have created a marble effect with the glass paint to create an even more striking look, brilliant for illuminating colour and light at your spooky party! If you want to give your balloons a Day of the Dead transformation, you could use the Dovecraft Candy Skull Clear Stamp to create a cool pattern! 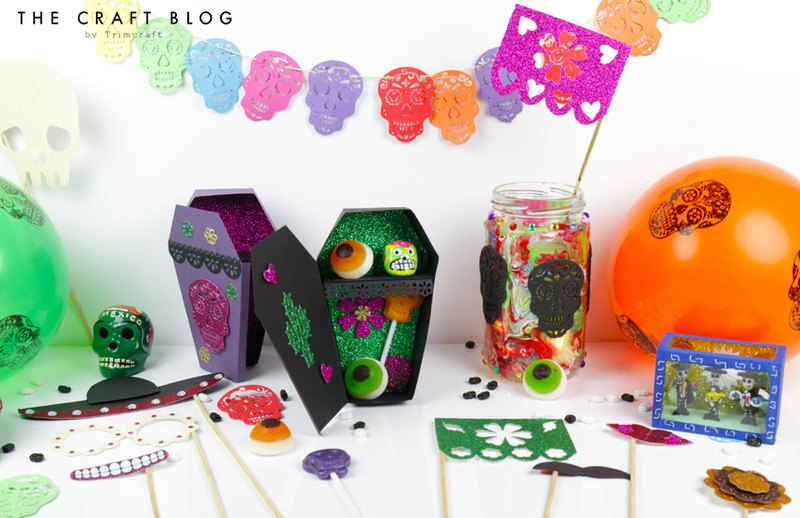 How will you use our ideas for your own Mexican Day of the Dead ideas and templates? We’d LOVE to see so don’t forget to #trimcraft when uploading to social media and to share your projects in the Inspiration area. ooh these look so much fun! Great idea for halloween at my kids school too!